“When people reach out to you for help, you want to help them in the best way possible and give them the best advantages to thrive,” says JaGerran Knight. 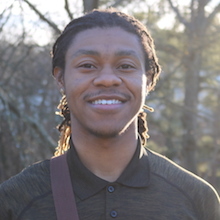 Graduating in 2019 with a Doctor of Chiropractic degree, Knight grew up with a father who was very ill with hepatitis A, hepatitis C, liver disease, hernias and diabetes, and at the end of his life, was on 22 different medications. He says, “You see your dad throwing up blood into the toilet, and he looks up at you and says, ‘all I want to do is be a dad.’ I believe that if my dad had seen a chiropractor, maybe he could have been on less medications, and since Chiropractic assists the body in healing itself, maybe he would have had a better chance at life.” Knight says that this had a profound effect on him that he drew inspiration from later in life. Even though Knight had his doubts, his mother’s back pain was getting better, her mood was improving and she was losing weight. He says that one day, she pulled him out of football practice and told him that he, too, was going to see Dr. Ernst. Again, he had no desire to go since he was skeptical and did not have any health problems. He went anyway, at his mother’s insistence. “When the doctor started the interview and exam, I just knew that he was ‘fishing’ for something to say was wrong with me. He even took x-rays, which I thought were totally unnecessary,” Knight recounts. Then, when he went to his follow-up appointment, Ernst told him about subluxations and asked if he had ever had problems with his vision. He answered that he never had vision problems, even being called ‘eagle-eye,’ and he knew for sure that the doctor was then ‘fishing’ for a condition. He wanted to leave immediately, but his mother convinced him to go ahead and have an adjustment. Knight went home that same day and sent his information in to attend a LIFE Leadership Weekend – but keep in mind that he was just a sophomore in high school at that point, and he says with a chuckle, “I didn’t know what I was getting myself into!” When he arrived at LIFE, he said that he felt right at home here. He adds that after he heard Dr. Riekeman talk about Vitalism, he realized that he had never heard health care being approached in that way, but it made so much sense to him. He knew that day that he truly wanted to pursue Chiropractic. Fast forward a few years and Knight graduates from East Carolina University with a B.S. in Biology as well as a B.A. in Chemistry. He says that since his plan had always been to attend LIFE, he chose undergraduate studies that would prepare him to do so.